Babka (or Bobka) is a yeast cake mada mainly in Eastern Europe, traditionally baked during Easter. 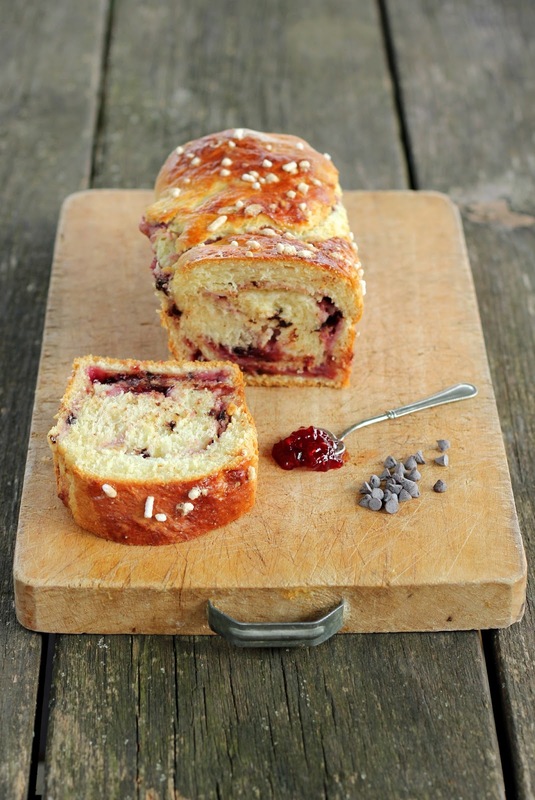 It's swirly brioche-like with a chocolate or cinnamon filling. I used ricotta and raspberry jam, to give it a summer twist. Melt the yeast in the warm milk and 2 tsp sugar and let rest for some minutes. Add 1/2 cup flour, eggs, egg yolk and the remaining sugar. Add the flour, 1/2 cup at a time, alternating with the soften butter. The batter will be very sticky. Let rise for at least 3 hours. Divide the dough in two and roll it into 2 rectangles of 45x25 cm. Prepare the filling beating ricotta and sugar. Set jam and chocolate aside. Spread the dough first with a layer of ricotta, then add scoops of jam and half chocolate chip. Starting from the short side, roll the rectangle over the filling to create a swirl. Put the babka in a plumcake tin and bake at 180° for 40 minutes.